White HousePresident Donald Trump talks on the phone aboard Air Force One during a flight to Philadelphia, Pennsylvania, to address a joint gathering of House and Senate Republicans on January 26, 2017. President Trump likes to tweet and make calls from a personal iPhone. Apparently, China and Russia are listening to his calls, the New York Times reported. A Chinese spokesperson said “if there are concerns about Apple calls being listened-in on, then you can change to Huawei phones,” which are not sold in the United States and have been accused of being Chinese spying devices. President Trump hasn’t given up his personal cell phone, unlike previous presidents, according to a report in the New York Times. Security officials wish he would use an official, secured White House landline – instead of his personal iPhones – to call up his friends and associates. Why? It’s because China and Russia are listening in on his calls, according to the Times report. “This just provides more evidence of the New York Times creating fake news,” Hua said in a statement, according to Bloomberg’s translation. “If there are concerns about Apple calls being listened-in on, then you can change to Huawei phones,” she continued. It was a clever quip from China. But according to the report, if Trump is being tapped, it’s not an iPhone issue, it’s a carrier vulnerability. 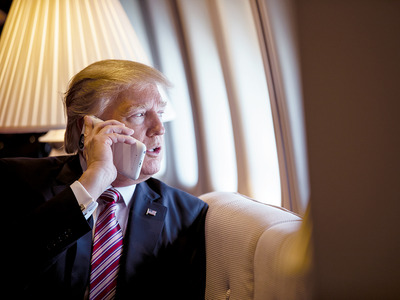 Trump is using insecure cellular networks to make his calls – so if his lines have been tapped, it’s a flaw in the cellular network protocols, not his choice of an iPhone as his personal device. “But the calls made from the phones are intercepted as they travel through the cell towers, cables and switches that make up national and international mobile phone networks,” according to the report. Trump would face the same issues with insecure calls if he used an Android device, including one made by Huawei, for example. The iPhone also supports encrypted apps such as FaceTime and Signal which would prevent an attacker from listening in to a phone call, which Trump has apparently chosen not to use. Huawei is China’s homegrown technology giant, which now sells more phones than Apple. But U.S. officials have also accused the company of building backdoors into its technology in order to spy on Americans. It’s unclear how foreign countries could tap the president’s cell phone. Facebook’s former chief information security officer explored the technical possibilities in a series of tweets, before concluding that, if true, the attack described in the report would be “novel,” meaning the capability was not publicly known. Russia’s Kremlin also issued a statement about the report on Trump’s iPhone. “We already treat such publications with humour,” a spokesman said, according to Bloomberg. The tweet was sent from an iPhone.